Discover a world beyond your imagination. $33.531 million on 3882 screens. In a crowded summer marketplace, 2013’s Epic had one advantage: it came out in a gap between other “family”/animated films. The Croods got a head start on the season; it arrived in late March and enjoyed a surprisingly strong box office presence. However, Croods had faded by late May when Epic arrived, and no other family-specific flicks came out in between those two. Epic then had that market all to itself for weeks; its next competitor would be Monsters University, but that movie didn’t arrive until four weeks after Epic. With all that room to breathe, one might’ve expected Epic to clean up at the box office. Alas, that didn’t occur. With a take of $107 million in the US, it didn’t bomb, but that figure certainly didn’t make it a hit. So I wouldn’t expect an Epic 2, though the existence of direct-to-video animation leaves open the option, I suppose. After her mother dies, teenaged MK (voiced by Amanda Seyfried) goes to live with her estranged father Bomba (Jason Sudeikis). However, the absent-minded scientist obsesses over the forest and pursues his belief that a species of tiny people lives there; this occupies all his time and prevents bonding with MK. Of course, MK dismisses her dad’s work as insanity, but she soon learns that he was right. She finds herself miniaturized to fit with the rinky-dink inhabitants – and ends up in the middle of a war between good and evil. The Queen of the Forest (Beyonce Knowles) will soon have a successor, and she chooses a leaf pod to bear this new ruler. However, led by Mandrake (Christoph Waltz), the wicked Boggans attempt to interfere with this, and the now-bite-sized MK ends up as the protector of the pod. She goes on an adventure to save the future queen and keep the forest safe. If asked for the reasons Epic failed to score a major audience, I’d partly chalk it up to a lack of clarity in advertising. As I recall, the movie’s promos tended to be pretty vague; they accentuated the presence of the tiny forest folks but offered little in terms of plot information. I also thought it became tough to gauge the movie’s tone from its advertising. Was it a comedy? An action flick? Some dreamy new age exploration of nature? In truth, Epic offers all of the above, which may be why the PR folks found it tough to spotlight any specifics. Still, it’s mostly a fairly traditional adventure-fantasy and shouldn’t have been quite so hard to sell. Though it’s an adventure-fantasy without much focus – and with too many obvious influences. Epic never really seems to know where it wants to go, so it rambles from one character/scenario to another without much clarity. Actually, it does tighten as it goes, but the lack of cohesion remains an issue. Especially since Epic often comes across as so derivative. 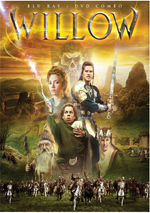 We find bits of Star Wars here, parts of Wizard of Oz there, a dollop of Honey I Shrunk the Kids on the side, and a whole lot of Disney all around – heck, the filmmakers even seem to take the mediocre Willow as a template. These elements combine to create a movie that never manages its own identity. Not that this makes Epic a film without entertainment value. While it does drag at times, it offers enough basic fun and adventure to keep it with us, largely due to the actors. Actually, our leads – Seyfried and heroic “Leafmen” Josh Hutcherson and Colin Farrell – lack much personality, but the supporting actors add zest. Christoph Waltz does well as the main villain, and Aziz Ansari and Chris O’Dowd make their sidekick roles a lot of fun; they’re probably the most enjoyable aspect of the film. Otherwise, Epic is a watchable animated flick without a ton of spark to make it soar. It seems unwilling to embrace the pure adventure it wants to be and tries to please too many masters along the way. While it comes with decent entertainment value, it lacks consistency. Epic appears in an aspect ratio of approximately 2.40:1 on this Blu-ray Disc. This was a mostly appealing presentation but it didn’t match up with the best modern animated images. Though it became tough to judge the image’s “flaws” because it appeared some were intentional. Epic could seem a bit soft, as more than a few shots lacked particularly good delineation. However, the film opted for an airy, diffuse look, so this softness was probably part of the design – to a degree, at least. I still thought the movie lacked the precision usually found in this sort of fare; at its best, it looked fine but never leapt off the screen. The rest of the presentation worked better. No issues with jagged edges or shimmering occurred, and edge haloes were absent. Print flaws never appeared either, as this was a clean image. Colors went with a fairly earthy, pastel palette that made sense given the forest setting. The hues seemed full and well-rendered throughout the film. Blacks were deep and firm, and low-light shots came across with nice clarity. The softness made this a “B” image, but it was still pretty good overall. No disclaimers come with the DTS-HD MA 7.1 soundtrack of Epic, as it offered an impressive affair. With all sorts of battle elements and flying creatures, the soundscape got the chance to open up in an involving manner. All the channels offered lots of information and kept the environment swirling around us from start to finish; this was an active, immersive soundfield. As expected, audio quality satisfied. Music was bright and dynamic, while speech appeared natural and distinctive. Effects displayed strong clarity and accuracy, with tight low-end when appropriate. I found a lot to like in this excellent soundtrack. A smattering of supplements complete the disc, all of which come in the form of featurettes. Birds, Bugs and Slugs: Forest Explorer goes for five minutes, 21 seconds and gives us notes about the real-life inspirations for the movie’s characters and settings. Aimed firmly at kids, this is a superficial but moderately informative piece. With the three-minute, 18-second Rot Rocks, we get another educational piece. It tells us about how important “rot” is to the ecosystem. Like “Explorer”, it goes for the youngsters; it works fine within that framework. More nature facts appear in Bugs of Camouflage. 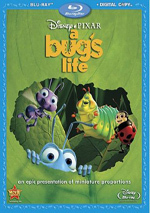 It lasts three minutes, 44 seconds and concentrates on how insects use camouflage for their survival; in addition to the same narrator as the first two pieces, “Ken the Bug Guy” throws out some facts. It becomes another moderately useful piece. Next we go to The Epic Life at 2 Inches. In this three-minute, 42-second featurette, we learn about “the physics of being tiny”. Quick and breezy, the show has some fun facts. Finally, Mysteries of Moonhaven breaks into seven segments. These run a total of 24 minutes, 39 seconds and feature director Chris Wedge, producers Jerry Davis and Lori Forte, production designer Greg Couch, supervising animators Galen Tan Chu and Melvin Tsing Chern Tan, co-producer Michael J. Travers, senior research associate Hugo M. Ayala, lead animators Jeff Gabor, David R. Sloss, Lluis Llobera, Scott Carroll, and Jackie Tarascio, art director Michael Knapp, animators David Zach, James Young Jackson, AJ Conrad, Yuehchih Eric Lin, Joseph Antonuccio, Matthew Doble, Julen Santiago Garaikoetxea, Thom Roberst and Stewart Shaw, senior character technical director Sabine Heller, and actors Josh Hutcherson, Beyonce Knowles, Aziz Ansari, Chris O’Dowd, Amanda Seyfried, and Jason Sudeikis. The programs look at visual and production design, the film’s physics, character/costume/weapon design, animation, cast and performances, and other filmmaking areas. After a series of educational pieces, it’s good to learn something about the making of Epic, and Mysteries does pretty well in that regard. It gives us a good mix of topics and participants to flesh out our understanding of the production. While not a great look at the flick, it delivers a reasonable amount of material and entertains along the way. The disc opens with ads for Percy Jackson: Sea of Monsters, Shrek: The Musical, and The Croods. These also appear under Sneak Peek along with promos for Turbo, Kung Fu Panda: Legends of Awesomeness and Dragons: Riders of Berk. The disc throws in the trailer for Epic as well. 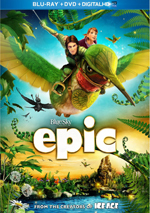 A second platter offers a DVD copy of Epic. It provides previews but none of the Blu-ray’s other bonus features. With Epic, we get a competent animated adventure. The movie does enough to keep us with it, but it fails to find its own personality. The Blu-ray provides good picture, excellent audio and a handful of moderately informative extras. I like the film but not enough to give it a strong endorsement.